Hurray! The San Diego Police Department (SDPD) finally has a new boat! After five long lean years of budget-cutting and skimpy funding for rebuilding staffing and equipment levels, the department took delivery of a new boat in October 2014 to use mainly on Mission Bay to enforce boating laws, improve public safety, investigate accidents and educate boaters. Living on Mission Bay, as my husband and I do, we regularly observe near collisions between recklessly-operated boats – often muscle or ski-boats – and swimmers, paddle boarders or kayakers whose quieter passions don’t mix well with speeding vessels. A chief function of the SDPD’s boat team officers, beyond issuing tickets for boating law violations and BUIs, is educating boaters about regulations limiting speed to 5 mph (not knots) when within 200 feet of a swimming beach and requiring 100 feet of separation from swimmers. “Our number one job out here is keeping everybody safe,” said Officer Larry Hesselgesser, the senior police man on the boat team whose regular job is community relations for SDPD’s Northern Division, including Mission Bay. He’s excited about the new boat, a rugged, heavy-duty plastic-hulled Triumph 215, for which he developed specs and solicited bids. He served 10 years on SDPD’s former Marine Unit and helps train other officers to operate the boat. But it’s a part-time, rather than full-time gig, He also has other duties. There are no plans to restore a larger, full-time Marine Unit. When SDPD announced in 2009 it was disbanding its Marine Unit, I testified against it to the City Council because of its value to boating safety. However, it fell victim to the city’s extended budget crisis and disappeared in early 2010. Two police boats were returned to the state of California, which had provided grant funding, and the full-time Marine Unit’s officers and sergeant returned to patrol duties. The city kept one inflatable patrol boat for which it had bought a replacement outboard engine. That tired boat is now 14 years old and soon to get some much needed repairs. Its collar deflates with use, its electronics are antiquated and its hard use over the last five years for busy summer patrols and emergency responses is showing. The department still had its Marine Unit through most of the “Floatopias,” the drink-a-thons on floating beach toys that attracted more than 6,000 inebriates to Mission Bay until mid-2010, when the City Council plugged the legal loophole enabling drinkers to by-pass the 2008 voter-passed beach alcohol ban. Down to one boat for the final Floatopia, the department had to rely on boats from other public safety agencies. In recent years the absence of regular police patrols on Mission Bay was noticeable, with fewer checks on irresponsible boaters. The lifeguards’ boating unit, hampered by aging vessels, patrolled whenever they could. 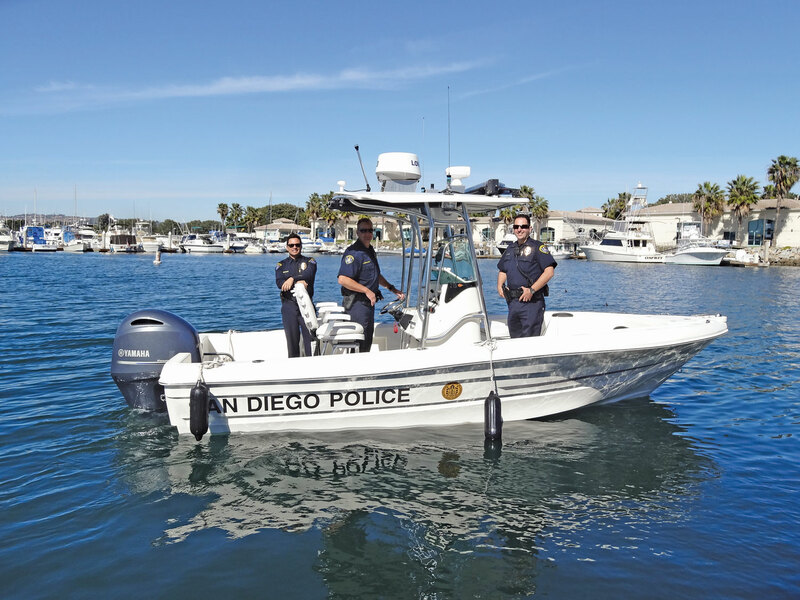 Recently, Hesselgesser and two colleagues took me out for a whirl on Mission Bay, putting the speedy new boat through its paces on a short run to the ocean, where the SDPD has jurisdiction 3 miles out. He pointed out its up-to-date electronics, including a chart plotter and interoperable radios able to communicate with all public safety agencies. It’s also equipped with regular and side-scan sonar, particularly helpful in locating anomalies on the sea bottom, such as a drowning victim, sunken boat or discarded contraband. It was side-scan sonar on another agency’s vessel which enabled the SDPD and Lifeguard Recovery Team divers to locate the body of a drowned Sail Bay kayaker last August. With San Diego city finances now more stable, it’s good to celebrate this sensible investment in boating safety.